Udoukpong, Bassey E., Okon, Cecilia P.
CRITICAL PERSPECTIVES ON SUCCESSION PLANNING IN THE COMMUTER TRANSPORT SECTOR IN ZIMBABWE. 1948: The First Arab-Israeli War, by Benny Morris. Yale University Press, 2008. 524 pages. $32.50, hardcover. Cultural Norms and Company Laws in Europe. 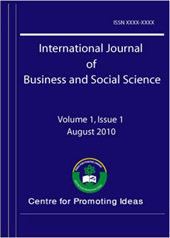 AN EVALUATION OF PROMOTIONAL ELEMENTS INFLUENCING SALES OF AN ORGANIZATION: A CASE STUDY OF SALES OF AGRICULTURAL AND NON-AGRICULTURAL PRODUCTS AMONG WOMEN GROUPS, HOMA BAY DISTRICT, KENYA.